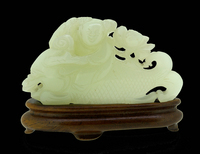 Scarce, rare and important antique Chinese early 18th century Qing dynasty very pale greenish white celadon jade / nephrite carving figure of a boy riding a dragon carp fish. The natural and untreated jade is superbly translucent and with perfectly even color and tone throughout the whole carving. The carving depicts a smiling boy that is portrayed sitting and riding the dragon face carp fish by clutching one of its horns with one hand and the other grasping a lingzhi or lotus flower sprig. The fish has its mouth partially open with stylized teeth showing within. The beautifully carved and engraved details show a superb mastership in the making of this fine antique Chinese carving. The whole figure measures 67 x 48mm (about 2.64" x 1.90") and has a gross weight of 34 grams. The piece is in an absolutely perfect condition with very little age wear and original hard to clear dust staying at some inner edges and cavities. Under microscope magnification, all hole carvings, as well as other circular carved cavities have been observed and all of them clearly show old hand carving and engraving techniques without any whatsoever modern drill or tool signs. The fish scale engraving manner and style, as well as the boy's eyes are typical for the early Qing dynasty engraving styles. The whole carving has a slightly curved design and stands on a fitted wooden stand. The wooden stand has its original auction sale lot number printed with a typewriter, as the present piece was originally purchased sometimes in the 1960s at a major Swiss auction sale, but unfortunately the previous owner had forgotten the exact auction name. The lot number was 993. The piece came from an old estate with a major collection of antique asian and other carvings. Absolutely scarce antique China jades collector piece and one of the rare early 18th century Qing dynasty white celadon jade carvings and figures.